DigRF 3G decode uses color-coded overlays on various sections of the protocol for an easy-to-understand visual display. Depending on the time base or the amount of zoom, the decode information is condensed or expanded to better assist in understanding events during short or long acquisitions. The DigRF 3G decode solution concentrates all your information in one place. Viewing the application layer of DigRF 3G signals on top of the physical layer provides a unique view that bus analyzers cannot. 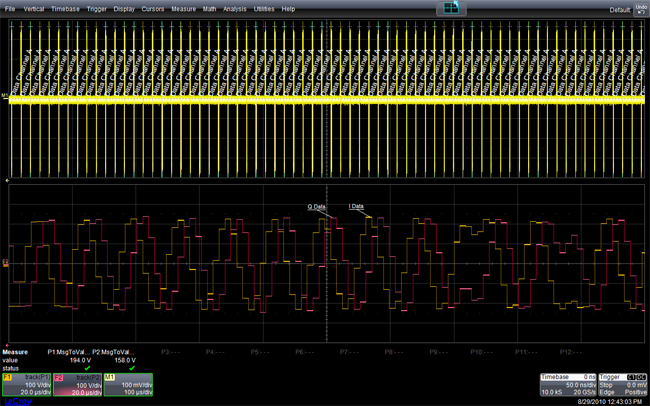 Measurements such as amplitude and rise time help to debug physical layer that may not be apparent in a protocol view. With the addition of the PROTObus MAG Serial Debug Tookit, DigRF 3G I and Q digital data payload fields may be quickly converted into a corresponding I and Q analog waveform representation for easy analysis and debug. View the I, Q or both waveforms in the time domain, and perform time / delay measurements on I and Q signals. Turn your oscilloscope into a protocol analyzer with the table display of protocol information. Custom configure the table to display the information you want, and export table data into an Excel file. Touch the message in the table and automatically zoom for detail. In all cases, the table never obscures your waveform. Search through a long record of decoded data by entering any of the 14 available search criteria by entering a value or simply finding the next occurrence.